Reprinted from biggestdrawingintheworld.com. Thanks to Steph and Curt! 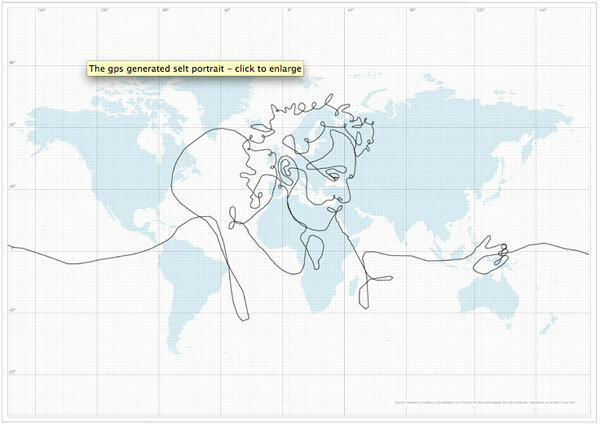 With the help of a GPS device and DHL, [Erik Nordenankar] has drawn a self portrait on our planet. [His] pen was a briefcase containing the GPS device, being sent around the world. The paths the briefcase took around the globe became the strokes of the drawing. The 17th of March 2008, [Erik] sent away a briefcase containing a GPS device with the express transportation company DHL. I gave them exact travel instructions, where to go, and in what order. 55 days later the briefcase returned to Stockholm. The GPS automatically recorded the briefcase’s journey around the world. The information was downloaded to [his] computer and gave [Erik his] drawing. Due to the GPS drawing technique and the magnitude of the drawing, the self portrait had to made in only one stroke. That giant stroke passed thru 6 continents and 62 countries, thus becoming 110,664 km long. After the jump: photos of the GPS briefcase, the itinerary, DHL receipts, and several youtube videos.